Daily Post headline: “De Facto Ban on Fracking in Wales” – a tad misleading! The UK Government will no longer issue licences for gas extraction in Wales, at the request of the Welsh Government. This appears too give Welsh Government the power over granting such licences, if it sees fit. It also would appear to give them the power to impose a moratorium or ban if it so decided. Notice the big “ifs” in these statements. Despite what you might read in some papers (e.g. 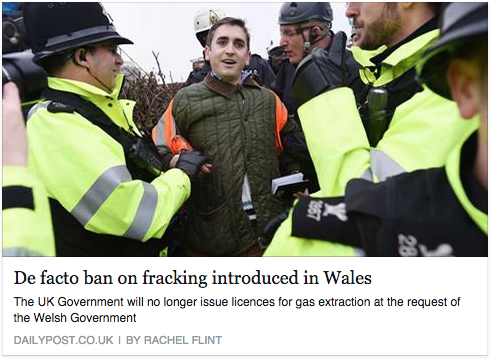 The Daily Post) this news does not represent a ‘de facto fracking ban’ at all. In fact this news only goes to underline the fact that until these powers are transferred, the supposed moratorium on fracking in Wales simply does not exist – despite the misreporting of the vote in February, tabled by Plaid Cymru, to agree to the principle of a moratorium. Labour’s Planning Minister, Carl Sargent, was shamelessly spinning these events in claiming the powers to impose a moratorium, called out by Gareth Clubb from Friends of the Earth Cymru. First Minister Carwyn Jones has never said more than he would ‘consider a moratorium’ if he ever had the powers to impose one. Well, the Welsh Labour government no longer has the option of sitting on the fence and using its default “It’s all Westminster’s fault” position. We should be able to expect an unambiguous statement of policy and intent regarding fracking and dirty fossil fuel technologies, from all the Parties aspiring to have a say in government in Wales after next year’s Assembly elections. This entry was posted in Uncategorized on August 7, 2015 by Bridgend's Green Leftie.